Grigori Zhislin was born in Leningrad USSR. He studied violin and viola with the great Russian teacher Yankelevitch at the Moscow Conservatoire, and early in his career won both the Silver Medal at the Queen Elizabeth of the Belgians International Violin Competition and first prize in the Paganini Violin Competition. 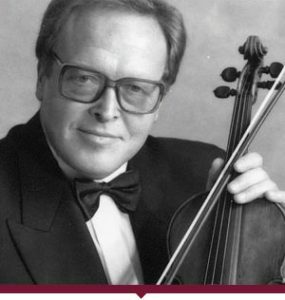 Since then his career worldwide has grown phenomenally and he now has an outstanding reputation as one the the finest violinists on the international circuit. His close collaboration with Penderecki has produced many highly acclaimed recordings and performances, indeed many of the composer’s works have been written for and dedicated to Grigori Zhislin. He has also worked closely with Schnittke. He is regularly invited as a soloist to major international music festivals, and as a teacher he is in constant demand. He is Professor of Violin and Viola at the Royal College of Music in London and also gives masterclasses around the world. Among his students who have gained worldwide recognition are Ilya Grubert and Dmitri Sitkovetsky.